End-to-end security you can rely on. Vehicle software systems are becoming increasingly complex. An ever-growing number of on-board systems and sensors must communicate with one another and with external sites. That requires the constitution of security mechanisms to protect systems from any damage that might result from unauthorized, external access. 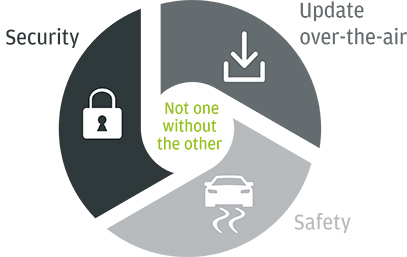 EB’s embedded security solutions protect ECUs, in-vehicle networks, and the connections to the outside world. Our security solutions consist of efficient embedded cryptography architectures based on AUTOSAR, and customer-specific requirements. EB’s security mechanisms are designed for secure communication, authenticated identification, theft protection, anomaly detection, intrusion detection, and all types of cryptographic calculations, secure updates, and secure diagnostics. With almost 30 years of expertise in the field of automotive software development—and more than 15 years of experience in engineering security processes and solutions—EB is the right partner for car makers and Tier 1 suppliers when electronic control units (ECUs) require a secure software base. EB’s security solutions are already on the road in millions of cars. EB is a one-stop-shop that offers everything from embedded to cloud security. Our platform-independent, modular offering lets our customers pick and choose products and solutions. EB’s portfolio is extended by Argus’ offerings. Argus is an independent company of Elektrobit. Our basic software for AUTOSAR-based ECUs. Adaptive AUTOSAR product line for high-performance controllers. For a safe AUTOSAR environment according to ISO26262 up to ASIL D.
Subscribe to our newsletter(s) and stay up-to-date on the latest products and news!